The Calgary Police Service is looking for a fourth person in relation to a weekend shooting that killed an innocent bystander. The man is described as black, approximately 20-years-old, 5’10” tall and about 160 lbs. The man often wears a gold medallion around his neck. At approximately 3 am Saturday, August 23, 2014, police were called to 11 Avenue and 1 Street S.W., for reports of gunfire. Upon arrival, officers found a female suffering from a gunshot wound. She was pronounced dead on scene. An autopsy conducted today confirms her identity as Natasha Mohamed FARAH, 26, of Toronto. The Calgary Police Service has three people already in custody in relation to to the incident. The three individuals were arrested at a hotel in northwest Calgary and are currently being questioned. A suspect vehicle that was observed leaving the scene of the shooting has been identified and located. On Saturday, August 23rd at approximately 4:30 in the afternoon, Kitscoty RCMP along with Marwayne Fire Department, Lloydminster Rescue Squad and Lloydminster Ambulance were dispatched to a plane crash that occurred approximately 35 km northwest of Lloydminster. The aircraft involved was a Cesna 180 float plane. The plane was travelling from Shoal Lake, MB with a final destination of Sherwood Park, AB. The plane had 2 scheduled stops for refuelling, the first one in Prince Albert, SK and the second was at Pasatchaw Lakes, northwest of Lloydminster. The plane had just refuelled and was attempting to take off. The wind had calmed down, making it difficult for the pilot to get the plane off the water. On the third attempt the plane lifted off but the wind died down and the plane came down at an angle and caught the wing on the water, causing the plane to cartwheel and land upside down on the water. Both the pilot and passenger were able to get out of the plane and swim to shore. Neither the pilot nor the passenger were injured in the crash. Both were checked over by ambulance personnel and released. The crash was referred to the Transport Safety Board for their follow up. On Monday August 25, 2014 at approximately 8:04 am The High River RCMP were dispatched to an injury motor vehicle collision of Highway 552 and 192 nd Street East, involving a pickup truck and passenger car. The collision occurred at a controlled intersection, however at the time the intersection was foggy. Fire departments from the MD of Foothill and Blackie were on scene and extracted a female driver, who was listed in critical condition. This driver was transported by STARS air ambulance. A male, who was the driver of a pickup truck, did not appear to be injured. An RCMP collision re-constructionist as well as the Integrated Traffic Unit assisted with the investigation which remains active. The pickup truck was equipped with "On Star" which initiated the 9-1-1 system following the collision. On 24 August, 2014 Airdrie RCMP responded to a Break and Enter at The Dollar Store on Yankee Valley Boulevard. Entrance to the store occurred sometime between 9:00 pm and 10:00 pm, when an unknown suspect pried open the front door. RCMP and a Dollar Store employee attended, and found that the only items that appeared disturbed were cans of Silly String. Numerous cans appeared to be missing. Investigators also located cans outside the store. Airdrie RCMP has seized evidence from the scene which is being analyzed by RCMP Forensic Identification Services. A local business with video surveillance has also agreed to assist. Investigators are asking anyone with information to come forward. On August 9, at approximately 6:30 p.m., two male suspects driving a blue Jeep broke into a rural business in Wetaskiwin County. The two suspects removed a window and crawled through to gain entry into the shop. Jerry cans, tools, and other miscellaneous items were taken. At 9:50 p.m. the Jeep and another unknown vehicle returned to the area and stole machinery and copper wire. The stolen items are valued at over $10,000. Above is a picture of the two male suspects and the Jeep. Anyone with information regarding this incident is asked to call the Wetaskiwin RCMP Detachment at 780-312-7200 or Crime Stoppers at 1-800-222-TIPS (8477). Crime Stoppers does not require you to reveal your identity. Further, if your tip leads to an arrest, you may qualify for a cash reward. On August 22nd, 2014, the McLennan RCMP Detachment was advised of a trailer being suspiciously abandoned in a secluded area of Township Seven-Ninety, north of McLennan, Alberta. Members attended and recovered an enclosed trailer and contents valued at approximately $30,000. Investigation revealed that the trailer had recently been stolen then left in a secluded spot where members of the McLennan RCMP Detachment believe the suspect(s) planned upon removing the contents of the trailer. A white Dodge SXT pick-up with aluminum wheels was reported in the area the trailer was recovered. The McLennan RCMP Detachment would like to thank the area residents who observed/reported the suspicious activity as they likely prevented the completion of the theft and allowed police to quickly recover the stolen property. The McLennan RCMP Detachment would like to encourage area residents to remain vigilant to suspicious activity, people and vehicles and immediately report them to police as these reports often contribute to preventing and solving crime. On the morning of August 23, 2014, Innisfail RCMP executed a search warrant at a rural property on South Pine Lake Road in located east of Innisfail, in Red Deer County, Alberta. With the assistance from members from the RCMP Auto Theft Units, Red Deer Police Dog Service, a search was conducted of the property in relation to an investigation into a possible 'chop shop' being operated at the location. Also located during the initial entry was a loaded .22 caliber rifle with a homemade silencer affixed to the barrel. In Canada any rifle which has a silencer attached is considered a prohibited firearm. Two individuals were located and arrested on site. 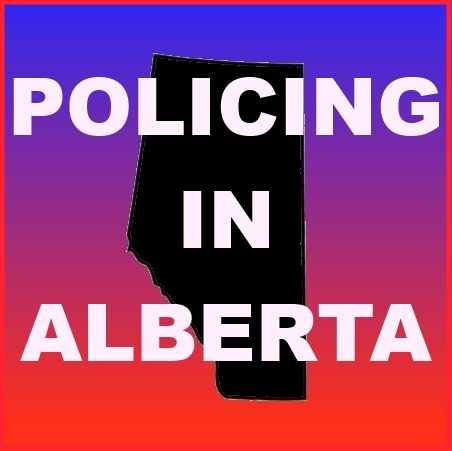 A 30 year old male Andrew MONTAGUE of Pine Lake, and a 37 year old male Kris ROWE are facing numerous charges most notable possession of stolen property exceeding $5000, and are scheduled to appear in Red Deer Provincial Court in September of 2014. The file is still under investigation by the Innisfail RCMP. On August 24, 2014 at approximately 1:00 p.m. Picture Butte RCMP attended a 2 vehicle collision at the intersection of Highway 23 and Highway 519 near Nobleford, AB. Nobleford Fire Department and Emergency services on scene. A south bound Lincoln MKZ, was in the left turning lane of Highway 23 waiting to turn east onto Highway 519. There were 2 vehicles stopped in northbound left turning lane of Highway 23 waiting to turn westbound on Hwy 519 obscuring the line of sight of the driver of the Lincoln. The Lincoln proceeded to turn left and struck a trailer being towed by a northbound Honda motorcycle, as the motorcycle was clearing the intersection. No injuries were sustained by any involved. Alcohol was not a factor in the collision. Charges are pending further investigation. RCMP are encouraging drivers to take a little extra time at intersections to insure it is safe, before deciding to move through intersections. On August 23rd at approximately 9:00 pm Strathmore RCMP responded to an Armed Robbery at the Auto Spa located at 755 Lakeside Boulevard in Strathmore. Sometime after 8 PM on August 23rd, a male entered the car wash holding a knife and demanded the money from the clerk. The suspect is described as a Caucasian male, 30-40 years old wearing black coveralls and a full faced 'paintball ' style mask. At approximately 4 a.m., Sunday, Aug. 24, 2014, police were called to the 0 -100 block of Tuscany Springs Hill N.W., where a woman had been shot. The victim was taken to hospital where she remains in critical but stable condition. Citizens are reminded to remain alert when in any public space and report suspicious activity to police. Investigators would like to thank Calgary Transit for their continued assistance with this investigation. The Edmonton Police Service is investigating the suspicious death of a male, who was discovered in a suite near 107 Avenue and 110 Street. Downtown Division patrol members responded to a ground floor suite at approximately 1:25 pm on Monday, August 25, 2014. Upon arrival, EPS patrol members discovered a deceased male, who appeared to be in his early 20s. Homicide detectives have since taken over the scene, and continue to conduct interviews with residents in the building. Investigators have not yet determined whether the male’s death is criminal or non-criminal in nature. An autopsy is expected to be conducted sometime on Tuesday to determine the cause of death and identity of the deceased. The Edmonton Police Service is investigating a shooting involving a 20-year-old male that occurred in a suite near 105 Street and 83 Avenue earlier today. Southwest patrol members responded to a report of shots fired at approximately 4:30 pm on Monday, August 25, 2014. Upon arrival, patrol members discovered a male in distress, who had sustained a gun-shot wound to his head. Paramedics treated the male on scene, before transporting him to hospital with life-threatening injuries. The male’s identity is not being released at this time until next of kin can be notified. Southwest Division detectives continue to interview residents in the area. Investigators have not yet determined whether the shooting is criminal or non-criminal in nature. The Edmonton Police Service is investigating a double fatal collision that occurred Sunday night in west Edmonton, which claimed the lives of two males and left a third male with injuries. It was reported that a Ford Crown Victoria was travelling northbound on 151 Street approaching 95 Avenue at approximately 9:45 p.m. on Sunday, August 24, 2014. The vehicle was allegedly travelling at a high rate of speed and failed to stop at a stop sign at 95 Avenue. Upon entering the intersection, the Ford was struck on the left rear corner by a Chrysler Concorde travelling eastbound on 95 Avenue. The Ford rotated counter-clockwise, continued northbound on 151 Street and collided with an unoccupied Mazda A31, parked on the west side of the street. The Ford then struck a large tree, causing catastrophic damage to the vehicle. The driver of the Ford, a 50-year-old male, and passenger, yet to be identified, were pronounced deceased at the scene. The 28-year-old male driver of the Chrysler sustained minor injuries. “Speed played a role in this collision. Alcohol may have also been a factor,” says Acting Staff Sgt. Gener Alvarado with the Major Collision Investigation Unit. The Edmonton Police Service continues to investigate. These are Edmonton’s 15th and 16th traffic fatalities of 2014. There were 17 traffic fatalities at this time in 2013. There is an iTunes phishing scam that is currently making the rounds on the internet. You may recieve an email which will appear to be from iTunes listing sometimes a large number transactions on your account, with a link at the bottom to click if you didn't make the purchases. If you click the link the scammers may either steal your itunes password or otherwise infect your computer with malware. To avoid falling victim to such a scam, never access your iTunes account through an email link. Instead always type itunes.apple.com directly into the browser and log in that way.